It had been vacated, sealed and winterized in June 2010, according to a notice on the wall posted by BAC Field Services Corporation, a division of Bank of America. It warned: “entry by unauthorized persons is strictly prohibited.” But Bank of America has clearly forgotten about the house and its requirement to provide the “maintenance and security” that would ensure the property could soon be reoccupied. The basement door is ajar, the plumbing has been torn out of the walls and the carpet is stained with water. The last family to live here bought the home for $175,000 in 2002; eight years later, the bank claimed an improbable $286,100 in past-due balances and repossessed it. “Anything I can do,” one woman tells the group after being briefed on its plan to rehab bank-owned homes and move in families without houses. She points across the street to a sagging, boarded-up place adorned with a worn banner—“Grandma’s House Child Care: Register Now!”—and a disconnected number. There are twenty banked-owned homes like it in a five-block radius. Records showed that at least five of them were years past due on their property taxes. Where exterior walls once were, some houses sport charred holes from fires lit by people trying to stay warm. In 2011, two Chicago firefighters died trying to extinguish such a fire at a vacant foreclosed building. Now, houses across the South Side are pockmarked with red Xs, indicating places the fire department believes to be structurally unsound. In other states—Wisconsin, Minnesota and New York, to name recent examples—foreclosed houses have taken to exploding after bank contractors forgot to turn off the gas. Since 2007, the foreclosure crisis has displaced at least 10 million people from more than 4 million homes across the country. Families have been evicted from colonials and bungalows, A-frames and two-family brownstones, trailers and ranches, apartment buildings and the prefabricated cookie-cutters that sprang up after World War II. The displaced are young and old, rich and poor, and of every race, ethnicity and religion. They add up to approximately the entire population of Michigan. Over the last year and a half, I traveled through many of these neighborhoods, reporting on the grassroots movements of resistance to foreclosure and displacement that have been springing up in the wake of the explosion. These community efforts have proven creative, inspiring and often effective—but in too many cities and towns, the landscape that forms the backdrop to such a movement of hope is one of almost overwhelming destruction. Lots filled with “Cheap Bank-Owned!” trailers line highways. Cities hire contractors dubbed “Blackwater Bailiffs” to keep pace with the dizzying eviction rate. In recent years, the foreclosure crisis has been turning many African-American communities into conflict zones, torn between a market hell-bent on commodifying life itself and communities organizing to protect their neighborhoods. The more I ventured into such areas, the more I came to realize that the clash of values going on isn’t just theoretical or metaphorical. It was three in the morning when at least a dozen police cruisers pulled up to the single-story, green-shuttered house in the African-American Atlanta suburb where Christine Frazer and her family lived. The precise number of sheriffs and deputies who arrived is disputed; the local radio station reported twenty-five, while Frazer recalled seeing between forty and fifty. “Who’s in the house?” they shouted. Aside from Frazer, a widow with a vocal devotion to the Man Above, there were three other residents: her 85-year-old mother, her adult daughter and her 4-year-old grandson. Things began to happen fast. Animal control rounded up the pets. Officers told the women to get dressed. Could she take a shower? Frazer asked. Imagine there’s a fire in your house, the officer replied. As in other hard-hit African-American neighborhoods across the country, residents here had organized to stop bank-pursued evictions from stripping the value from the community. Neighborhood support had, for instance, helped a mother named Monique White beat her eviction in a highly publicized six-month battle against US Bank only weeks before I arrived. Still, the never-ending evictions were eating away at the stability of the neighborhood. As we drove, we discussed the illegal chain of events that transformed these homes into drug dens. The crimes started at the top. Banks peddled toxic mortgages like crack, paying employees cash incentives to push them in African-American neighborhoods. The loans exploded, so they forged millions of foreclosure affidavits to speed state-enforced evictions. Once homes are vacant, bank contractors insufficiently seal and maintain them, allowing intruders to strip the houses of their copper wiring, plumbing and sometimes even the furnace. The copper alone sells for anywhere from 50 cents to a dollar per pound. Finally, people dealing drugs begin to use the houses at night as distribution centers. The street-level crime drags down neighboring property values, spurring more foreclosures and evictions. And so the cycle continues. Banks are legally obligated to maintain and market their foreclosed properties, but they often shirk those responsibilities—especially in communities of color. 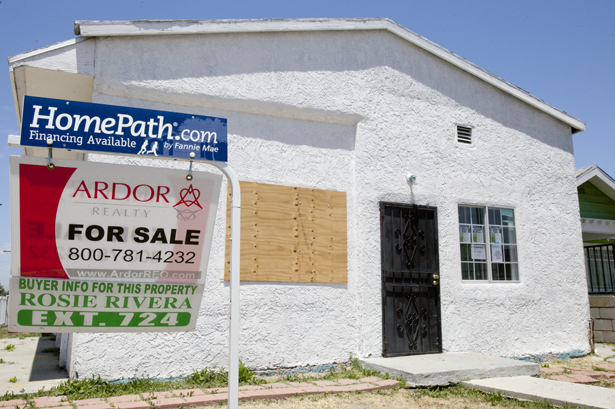 In an investigation of more than 1,000 homes across the country, the National Fair Housing Alliance found that bank-owned homes in communities of color were more likely than homes in white neighborhoods to have graffiti and peeling paint on the exterior, trash and dead leaves strewn across the sidewalk, unsecured locks on the doors and be missing “for sale” signs on their front lawns. The double standards in property maintenance lead to an “extremely troubling” trend in home sales: these uninviting neglected houses, disproportionately located in communities of color, are most often being snapped up by investors rather than families. Overwhelmingly, the investor of choice is the Blackstone Group, one of the world’s largest private equity firms and now the nation’s largest owner of single-family homes. Since April 2012, Blackstone has spent more than $4.5 billion buying at least 30,000 houses concentrated in cities hard-hit by foreclosure, including Atlanta, Jacksonville, Orlando, Chicago, Charlotte, Phoenix and urban areas across California. According to local real estate brokers, the company often makes its purchases in cash. The idea is that there’s big money to be made in rental properties these days, given that there are millions of displaced, former homeowners with wrecked credit scores looking for places to stay. It’s like a pay-to-play game of musical chairs—except Wall Street owns the stereo, the speakers, the chairs and the roof, and somehow when the music stops you’re always out. A 2011 report by the US Government Accountability Office, submitted to the House Subcommittee on Regulatory Affairs, cited nearly a dozen examples of how such declines in tax revenues caused by vacancies have led cities to cut funding for public works, libraries, parks, recreation programs and school districts. One city even cut a program intended to address vacant foreclosed properties, thanks to a tax revenue shortfall. What do the cases of Edward Snowden and Robert Seldon Lady have in common?